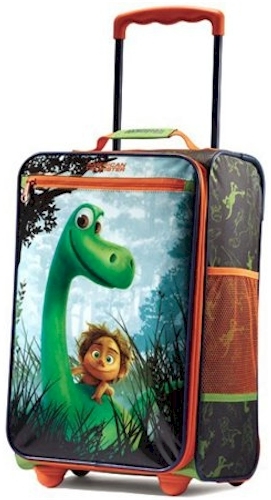 BuyDig has got this American Tourister Disney 18" Upright Children's "The Good Dinosaur" Luggage priced at $37.50, but when you enter promo code DISNEY60 at checkout, that price drops by 60% to $14.99 with free standard shipping. This American Tourister bag got 5.0 out of 5 stars over 28 customer reviews. Description: Traveling with the American Tourister Disney 18" Upright Softside Suitcase is so much fun. The retractable handle and inline skate wheels make travel easy. The zippered front pocket is perfect for books. The interior compartment and cross straps keep everything secure. Retractable handle: Provides easy maneuverability when extended out from the case, and stores neatly inside when not in use, Locks in place in both the fully extended and stored positions for secure traveling.